I love flowers, I always have done and I particularly enjoy decorating for weddings and parties. My inspiration for wedding flowers is drawn directly from nature. Colours, textures, and the different seasons are all met head on as I select the latest combination of fresh flowers and foliage’s on a very early morning visit to the flower market in London! 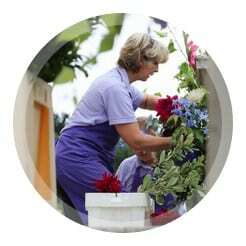 Having worked in the floral industry for over 25 years I have been lucky enough to have gained a huge wealth of experience from working both in the countryside and in London’s West End. Throughout this time it has been my absolute pleasure to have worked at the highest level of flower decorating on a variety of events. Functions have included numerous society parties, charity gala dinners, government hospitality functions and private weddings, including the most recent royal weddings both at Windsor Castle and at Westminster Abbey. Today, I work purely as an events florist. I’m based from a studio on a small business centre which is on the border of Hampshire, Surrey and West Sussex. I specialise in wedding flowers and all associated decorations. So, if you would like me to supply vintage style signs or hearts, winter sparkling twigs, coach lanterns, tea lights or white fairy lights I can incorporate them all with your fresh flowers. Louise Avery Flowers is a small company dedicated to wedding flowers and wedding loveliness. I am thrilled to have gained a great reputation for being highly reliable, knowledgeable, helpful, professional and for exceeding client’s expectations. To give you complete confidence I offer a fully bespoke service that takes care of every detail. In tailoring your flowers to your particular style you can then relax and in turn, thoroughly enjoy your big day.